Be the first to share your favorite memory, photo or story of Sharon Ann. This memorial page is dedicated for family, friends and future generations to celebrate the life of their loved one. 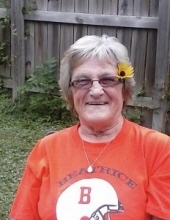 Sharon Ann “Momma Sharon” Abitz, 72, of Beatrice passed away Sunday morning, January 27, 2019 at her daughter’s home surrounded by her family. She was born June 19, 1946 at Beatrice to Herman and Ann (Ideus) Schoneweis. She worked as a CNA for over 50 years, starting her career at the original Lutheran Hospital in Beatrice and then went onto work several different places, finishing her career at Parkview Care Center (the original Lutheran Hospital). She was a member of St. John Lutheran Church of Beatrice. She married Roger Abitz on January 27, 1995 in Beatrice. She loved taking care of people and her door was always open. She loved to dance, play golf, barbarque, make people laugh, and was a Husker and Kansas State fan. She especially loved her kids and worried about them right up to the end. Survivors include her one daughter, Jessica Weeks and significant other, James White of Beatrice; three sons, James D. (Marae) Zimmerman of Blue Springs, Timothy (Shelly) Zimmerman of Panhandle, TX and Randall R. Weeks, Jr. of Beatrice; step-daughter, Jamie (Josh) Mullin; step-son, Chad Abitz and family; eleven grandchildren, William Carter, Dugan Lathrom, Chanses Lathrom, Samuel (Bettie) Zimmerman, Sydney Zimmerman, Zachary Zimmerman, Elizabeth (Hunter) Smith, Mackenzie (Matt) Southard, Alexis Zimmerman, Joshua Zimmerman, and Baby Randi; four great-grandchildren including two on the way; two brothers, Delmar (Sharon) Schoneweis and Harlan Schoneweis both of Beatrice; one sister-in-law, Alice Schoneweis; numerous other relatives; and Tilly, her companion dog. She was preceded in death by her parents, Herman and Ann Ideus Schoneweis; her husband, Roger; brother, Eldean Schoneweis and sister-in-law, Mary Schoneweis. Funeral services will be held at 10:30 A.M. on Thursday, January 31, 2019 at Fox Funeral Home of Beatrice with Chaplain Sharon Schuster officiating. Burial will be in the Evergreen Home Cemetery of Beatrice. A memorial has been established to the family for future designation. The body will lie in state at the Fox Funeral Home of Beatrice from 12;00 noon to 8:00 P.M. Wednesday with the family meeting and greeting friends and other relatives from 6:00 P.M. to 8:00 P.M. on Wednesday. www.foxfuneralhome.net Fox Funeral Home of Beatrice in charge of arrangements. To send flowers or a remembrance gift to the family of Sharon Ann "Momma Sharon" Abitz, please visit our Tribute Store. "Email Address" would like to share the life celebration of Sharon Ann "Momma Sharon" Abitz. Click on the "link" to go to share a favorite memory or leave a condolence message for the family.